House, 4 Bedrooms + Convertible bed(s), 2.5 Baths, (Sleeps 8-12). 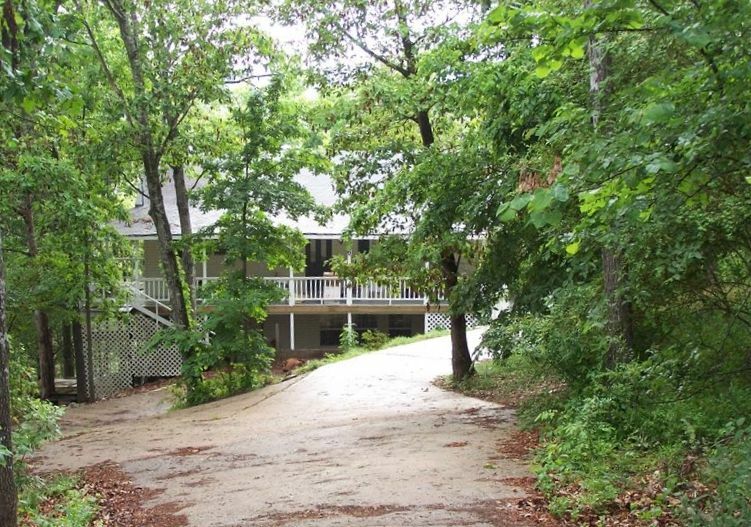 Nestled among the towering trees of the Ozark Mountains on a hill overlooking the beautiful South Fork of Spring River is your escape from reality. A charming two story house boasts the ability to delight everyone. Whether you are looking for a group get together or an intimate rendezvous, our home is waiting to fit your desires. Explore a winding river full of trout or experience the rush and thrill of canoeing it’s falls and rapids. Or perhaps you and your kids want to float the river in inner tubes. It is waiting for you. Interested in ole time charm? Why not spend time antique shopping in the Hardy area or visit their railroad museum. Just down the road is Mammoth Springs with its quaint shops and galleries. Be sure not to miss Blanchard Spring and it’s caverns or Mountain View with its musical atmosphere. From country to blues, the Arkansas Traveller entertainers are the talk of the Hardy! You are also close enough to Memphis and Branson to enjoy more of your music pleasure. With two long decks stretching along the back, it has 4 bedrooms, 2.5 bathrooms, 2 living rooms with fireplaces, fully equipped kitchen and laundry room, yet, easily accessible. It can sleep up to 12 easily, but the upstairs can be cozy enough for two. As former campers in the Hardy Arkansas Area, we feel so fortunate to have spent a number of years in this amazing place. Upon finding this beautiful home, we realized we had an opportunity to share our love of this area with others. The tranquality of the river, the excitement of the rapids and the relaxing sounds of the water have made this home a wonderful place for our family reunions and get-away weekends. Friends and family love to fish, canoe, kayak, hunt and horseback ride. Our city friends enjoy the quaint shops of Hardy while getting away from the stress of the city. Property is on Southfork of Sprng River. Beautiful property with a wonderful view. We had a great trip with friends. Very large rooms to entertain. It was too cold for the porch but it was a beautiful view and would love to come back in the summer. It was exactly what was described. Very spacious and very clean. Will definitely stay here again. Great group of guys that came for a work getaway. Left our place spotless. Would love to have them back. Awesome views. House was old but has awesome history. My family enjoyed our time here. It was awesome for my aunt's 69 birthday sleepover. My only complaint is that it went from being reasonably priced to overpriced when all fees were added. When I received confirmation I noticed check in was 3pm and out was 11am which meant we paid $300 for less than 24 hours. I was told we have to pay extra $55 to check in at 10. Place is perfect for a group but I will do my homework before confirming the next rental. Everyone enjoyed the house and the location. Kids had fun exploring the hill sides and river below. We enjoyed the history of the place as well. Delightful place overlooking South Fork River! The spacious house was perfect for our family reunion. We went to the river, too, and enjoyed our time there. One of our favorite places to stay when we visit Hardy!